At this point of the season, you need to do whatever it takes to survive. The De La Salle Men’s Football Team earned a hard-fought 2-0 victory over UE earlier today at the FEU-Diliman field. The win avenged the Taft-based XI’s first round setback to the Warriors and kept them in the hunt for a return trip to the Final Four. Rookie John Rhey Lagura continued his fine form by breaking the deadlock in the 76thminute which was a tightly contested match till that point. He pounced on a spilled ball by the UE goalkeeper and patiently slotted it in past two defenders for the lead. The match was finally secured in the 92nd minute when the UE keeper misread a long free from centerback Jovan Marfiga at it bounced over his head and into the goal. 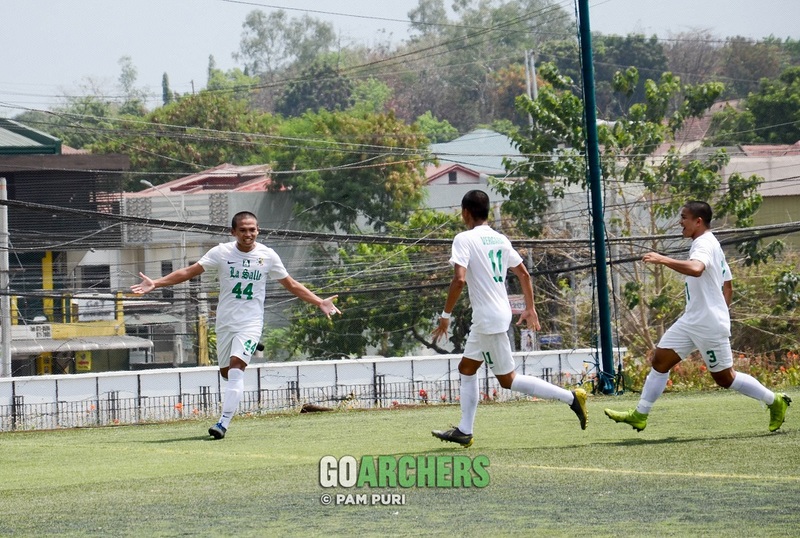 Marfiga was just one of the standout performances for the Green and White as Coach Alvin Ocampo started 9 rookies in his youngest first eleven yet this season. “Not convincing yet a win is win, we managed to recover from a loss to them in the first round,” said Ocampo. La Salle now enters the Holy Week break at 19 points with 2 matches remaining in an extremely close semis race. The Archers next face the NU Bulldogs on April 25 at 1:30PM.